"Sure, Buddy Mondlock has written great songs recorded by folks like Art Garfunkel, Nancy Griffith, Guy Clark and Garth Brooks," says Candy Peavy, "but there’s nothing like hearing the guy who wrote ‘em, sing ‘em. Now Buddy won’t pin your ears back with these songs, but he’s going to draw you into his world. From someone’s living room all the way to the Royal Albert Hall, Buddy has been there, done that. He’ll be doing it again Sunday, May 6 at the House Concert Series. Hope you can make it." $15, which includes a little supper and very civilized company. Bradley Kay announces, "Songwriters Night this Thursday and every Thursday afterwards at 516 Soundstage. And it begins at 7:30 pm. 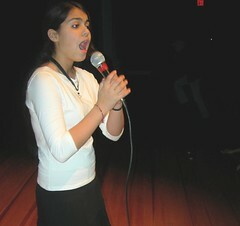 You can come to watch and enjoy or to perform: to read a poem, sing a song or just anyting original that involves a mic." Creative types who need to face the spiky world of public performing, be aware. Shreveport Little Theatre’s musical comedy The Great American Trailer Park Musical will unhitch on May 3, 4, 5, 11, 12, 17, 18, 19 at 8 p.m. and May 6, 20 at 2 p.m, says Bobby Darrow. The Great American Trailer Park Musical has been described as Jerry Springer set to music. 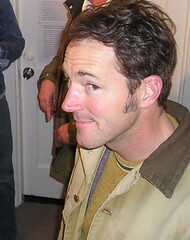 The cast features Michael Blake Powell, Kim A. Price, Rachael Magill, Mandy Perdue, Robbie Dean and Lisa Gallegos. Robert Darrow directs, D.J. 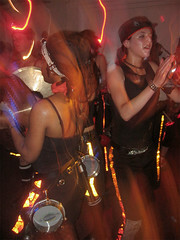 Harman is musical director, and Laura M. Beeman serves as choreographer. The production crew includes Mike Jarrett, set design and construction, David White, lighting design, Carolyn Bryant, hair designs, and Sandy Todaro, costumes. Box office: noon to 4:00 p.m. weekdays; 424-4439. Donna McKechnie has been all across the map of Broadway as dancer, actress and singer. While in Shreveport to star in River City Repertoire's Glass Menagerie she is sharing her background via her autobiography. It is called Time Steps, My Musical Comedy Life. Here's one little section from her career via Wikipedia.org: "After doing a Welch's Grape Juice commercial and the first L'eggs stockings commercial, she was cast in a touring company of West Side Story. In 1961, she made her Broadway debut in How to Succeed in Business Without Really Trying, where she met choreographer Bob Fosse and his wife, Gwen Verdon, the show's dance captain. A stint in a Philadelphia production of A Funny Thing Happened on the Way to the Forum was followed by the NBC music series Hullabaloo, where she was a featured dancer. There she met Michael Bennett, who became a guiding force in her life and career. Her television work included a regular role on the Gothic soap opera, Dark Shadows, guest appearances on The Scarecrow and Mrs. King, Rowan & Martin's Laugh In and Cheers, plus the role of Suzi Laird on several Fame episodes." 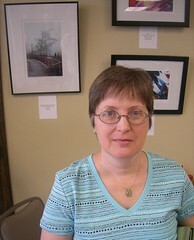 Meet Mckechnie at Tower Books on Sat, may 5, as she signs books from 1 to 3 pm. Tower has moved to Uptown Square, next door to Starbuck's. See her in Menagerie on May 17,18,19, 20, 23, 24 and 25, says director Patric McWilliams. River City Rep reservations: 318-424-6805. Some of the city's top young thespians will croon and hoof upon the First Methoodist PAC stage in the Academy of Children's Theater production of Throughly Modern Millie. Playing the title role is Ansley Hughes, an actress with a smoky, tuneful and strong voice and flashing eyes. Backing her are Lily Whitaker, also gifted in song and dance, who brings sardonic humor to the stage. The group is anchored by journeyman actress Susan Kirton, a canny and appealing lass who has played upon many local stages. Watch out for Casey Bozenski, a fluent singer and actor who can switch roles from bad guy to good within a backstage heartbeat. Also having proven themselves in numerous local productions in recent years are Angela Kang, also clear and tuneful of voice and possessed of deadly timing, and Tyler Northen, a fellow with many characters inside. Millie is a tale of a flapper who would be a golddigger. However, in the Priscilla Hotel she discovers a white slavery ring operated by the property's proprietor and her two bumbling Asian henchmen. The ideal kidnapping targets are the attractive, flapper tenants. When Millie realizes what is transpiring, she devises a scheme to save her friend from the slavers. Before long, her boyfriend, Jimmy, is in drag, her boss, Trevor, is drugged, and fireworks are exploding in Chinatown. Somehow the chaos leads to a happy ending. The show dates are May 3 - 5 at 7 pm and May 10 - 12 at 7 pm, says director-choreographer Laren Ross. The box office opens at noon on Mon, Ap 30, says co-director Cynthia Whitaker. Tickets are $20 for adults and $15 for students and children. Two stages at Artbreak, at Shreveport's new Convention Center, are filled by commuity and school performing groups every thirty minutes. There's dance galore, there's jazz, percussion and singing of every type, says Pam Atchison. Additionally, the AEP Swepco Stage features storytelling by professional storytellers along with poetry and prose readings by students under the direction of Manny Guendulay. Peter Pan Players, under the direction of Trey Jackson, are encouraging young “stars” in a Creative Dramatics acting project that features the characterization of popular fairytales with costumes and makeup. Jane Heggen will create several large-scale Paper Mache Sculptures demonstrating the Life Cycle of a Butterfly. The Butterfly Sculptures will be developed during Third Grade Days and the Festival Weekend. 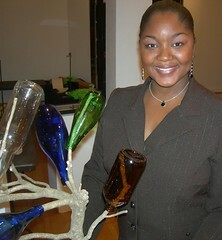 Tarama Davenport is renowned for her work with Middle School Students who participate in SRAC’s ArtSmart After School Academics through the Arts program as well as her work as a resident artist in the artspace Fun-A-Torium. Tarama will teach students and families to create their own butterflies from wire frames and tissue paper. Jerry Davenport will design a sculpture of “Grandpa’s Head” with a wire frame to create a permanent sculptural display that will be used in the artspace Fun-A-Torium for children to enjoy a weekly hunt to “find Grandpa’s teeth” during the “Art of Disney’s MEET THE ROBINSONS” Exhibition. Artist Gerald Ortego will teach students and family members to design and create their own clay sculptural character from the movie, MEET THE ROBINSONS! Kelly McDade, Art Professor at Bossier Parish Community College, will partner with the culinary team of the new Hilton Hotel at the Convention Center and the delicatessen staff at the Line Avenue Brookshire Grocery Store to create a giant sculpture that will motivate families to make smaller versions of edible sculptures using delicacies found in the pantry: marshmallows, raisons, fruits and veggies! The Extreme Balloon Team, duo from Dallas, Texas will bring their zany balloon mastery to ArtBreak. They will attempt to break a world record through a speed contest that involves making balloon poodles behind their back in addition to creating giant balloon structures and leading balloon-blowing contests along with unlimited laughter and fun. A major component of the 2007 ArtBreak festival include the creation of a 25’ tall POET-TREE designed by Shirley White based upon the Shel Silverstein story, “The Giving Tree” and featuring creation stations for Haiku Poetry, Calligraphy, and Leaf Printing. The ArtBreak Festival and the Very Special Arts Festival have merged to celebrate the artistic abilities of people who are mentally or physically disabled. This year’s festival partners with the Louisiana Association for the Blind to demonstrate how artists see by touch or feel. Throughout the festival, students and families will look at art through the eyes of those who do not see. Professional Artist John Bramblitt is a guest professional artist from Dallas, Texas, who teaches how to mix texture into paints in order to distinguish colors; then he shows how an artist discovers the borders of the canvas and spatial relationships among the images. Sculptor Stephen Soffer will introduce students and families to seeing by touching. Students will wear blindfolds while they explore a series of large and small sculptural artworks created by Stephen. Alicia Smith will lead students and families through a blindfolded exercise that begins with an “unseen” exploration of found objects. Artists will be able to select from a collection of small objects that they will put together into a sculpture. Alicia will help the young artists to assemble their sculpture, then, using touch only, they will add the sculpture to others that have been previously created and placed in the large shadow box. Speaking of murals, nationally renowned muralist Chris Opp will make a mural with student artists. Other weekend activities include an ArtBreak Cake Walk, the Art Alley featuring students from Ridgeway Middle School as the arts instructors, the Virtual Visual Gallery featuring 20 laptop computers that are programmed with Kid Pix Deluxe, the Inflatable Drawing Room created by Sir Kevin Wolfe and animated by artist Michael Phillips. Neecee Blackwell brings her “facial creations” to the hands and faces of young ArtBreak stars with full-face designs...or, chose a wild and wacky animal design for your hands. Only the Cake Walk and the Face Painting require a coupon, all other hands-on activities are free. Please see more on parking, etc, below. With music and color and myrid choices of artful fun, ArtBreak Festival opens to the public on Friday, April 27th at 5:00 pm, says Pam Atchison. Kick-off performances are by Yazzi, high school students performing jazz, produced by the Theatre of the Performing Arts and Executive Director, Gloria Gipson; and a 5:30 pm performance by Razzmatazz, a high-energy group of interactive, roots music entertainers. Festival Hours are Friday, April 27: 5:00 pm – 10:00 pm; Saturday, April 28: 10:00 am – 10:00 pm; and Sunday, April 29: 12:00 noon – 6:00 pm. Admission to ArtBreak is free; there is plenty of free parking surrounding the Shreveport Convention Center; there is a free “Yellow Bus Trolley” transporting festivalgoers from the AmSouth Bank Parking Garage to the Shreveport Convention Center. Those who wish to park in the Shreveport Convention Center Parking Garage located between Spring Street and Market Street at Caddo Street will pay $3.00 per car to park. The Convention Center will provide concession booths with special “kid friendly” menus and pricing. "Can you imagine: tons o' people in over 700 cities in over 60 countries on at least 6 continents all doing tai chi and qigong at the same time with a wave of tai chi circling the entire planet for as long as it takes? Should be quite a rush," says Sifu Janis Gabriel of the Phonix Virtue Temple, corner of Highland and Robinson. She's referring to World Tai Chi and Qi Gong Day, to be celebrated locally in Betty Virginia Park from 9 am to noon Sat, Ap 28. 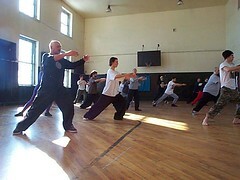 Devotees under the instruction of Sifu Janis are usually joined by the troupe led by Glen Guerin, proprietor of Lee's White leopard Kung Fu and a deep practioner and instructor of Tai Chi. This year the group will be joined by Tibetan Buddhist Karma Rinpoche, a monk in residence at Meadows Museum of Art this weekend. 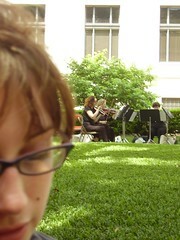 Music on the square: the Brown Bag Luncheon on Fridays at the Caddo Courthouse from 11:30 am - 1:30 on the Milam St. side. Bring your lunch and wear a brown bag over your head suggests puckish musician-producer Bruce Flett. Aint it a pity, he's in New York City, to paraphrase Huddie Ledbetter. While the Bluebirds return to the New Orleans Jazz & Heritage Festival on Sun, Ap 29, they do so without Buddy Flett. "Buddy is doing so well on the Blues From the Backroads tour that they won't let him leave! He was in Atlanta last night at the Roxy. He's got to finish out the tour this Fri 4/27 at Orlando House of Blues and Sat 4/28 in Tampa before he goes back on tour with the Bluebirds," explains Bruce Flett. It will be Jason Coffield, Bruce Flett, and drummer Cody Lowery at Jazzfest this Sunday at 1 pm on the Lagniappe Stage. They'll be doing all Bluebirds originals, according to publicist Keith Abel. 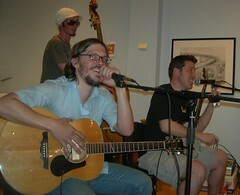 Coffield has picked up the vocals as well as slide guitar for the trio's complete repertoire. Buddy's performance of Honky Tonk on the Kenny Wayne Shepherd 10 Days Out CD/DVD is currently #2 on XM Satellite Bluesville channel, says Buddy Flett. The tune was originally released on the Bluebirds Swamp Stomp CD. Buddy's got a new album, Mississippi Sea, and his first website: myspace.com/buddyflett. His unoffical Mississippi Sea video is on Youtube and has picked up some 2,275 visits and 21 comments. There's still more at bluebirds.com. Robots! Teams from Broadmoor Middle Laboratory, Linwood, Ridgewood and Keithville middle schools will apply their skills toward becoming automation sensations, says Eric Gipson, in the first annual Middle School Robotics Competition. It's this Saturday at Sci-Port Discovery Center. The day of ‘total technology’ will also include participation by the Shreveport Police Department, Caddo Parish School Board, LSUS, C.E. Byrd and Southwood high schools. 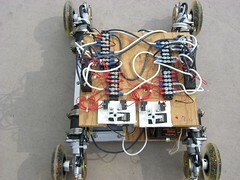 The middle school teams will be presented with their challenges at 9 a.m. and with laptop computers and robotics kits, design and build their contraptions until they are put to the test in the competition from 3 to 5 p.m. It's 3:51 AM. Your Mac's hard drive fails as you save an important project, proposes Thomas Avallone. Do you know where your backup is? At this month's Spt Mac Users Group (SMUG) meeting, meetees will explore options for backing up their digital life. Feel free to share your own backup plans as well as horror stories of data lost, says Avallone. WiFi will be available. As always, admission is free. Sorry to say it, but your hard drive failure is going to arrive when you least want to hear about it. Prepare for thy doom, digerati. Originally uploaded by cruel shoes. 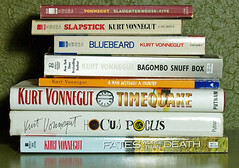 West Edge Books, 725 Milam St., will host "So It Goes: A Celebration of the Life and Work of Kurt Vonnegut." This will be an interactive event, and will take place at 7 p.m. on Tues, May 1, says Michael Parker. The gathering is free and open to the public, who are asked to share memories of and readings of favorite passages by the late novelist and WWII veteran who was known as a humanist, countercultural icon and outspoken opponent of war. Vonnegut passed away recently at the age of 84. To avoid duplication of readings, those wishing to participate are asked to sign up with event organizer Michael Parker. Vonnegut's works include Slaughterhouse-Five, Cat's Cradle, The Sirens of Titan, Galapagos and God Bless You, Mr. Rosewater. Michael Parkers' ramblings round the country and his stint at the protean Powell's Books of Portland have enriched his uranium. He's operating his spot at the West Edge Artists Co-op as though he were in a college town. It's a lovely situation for those who care about books and those who want something literarily spicy. Attendance at the lectures and readings he sponsors have run from 20 to 40, he says. In Shreveport, and on Milam St, those are healthy numbers. Parking is plentiful and safe. In the evening West Edge Artists share the big First Methodist lot. Chris Nolan, a member of the West Edge Artist's Co-op and Northwest Louisiana Artists, is opening a photography show May 7. She will present 49 water-related photographs, many taken in Shreveport. It is called "The Beauty of Water," photography by Chris Nolan. Opening Reception Monday, May 7, 2007 at 6:30 p.m.
"Your readers may want to attend the opening as East Bank is not open weekends or evenings except for the opening. I can be reached easier at my yahoo account: chriscnolan@yahoo.com. " Dine with any of the following restaurants on Tues, Ap 24, and they will donate 25% of your check to the Philadelphia Center to help fight HIV/AIDS in Northwest Louisiana, says Kelly Stover. Kelly Stover, Director of Development at the Philadelphia Center @ 222-6633 ext. 25. Originally uploaded by Hola Augusta. The esteemed singers of Opus Quatro will present a concert at Anderson Auditorium, Hurley School of Music, Centenary College, on Sat, May 19, at 8 pm. The show is a benefit for the Food Bank of NW La. We’ve just posted a Quicktime movie, says Chris Jay, of All Things Come To Light, the film I have been creating with senior Telecommunications Magnet students at Booker T. Washington High School. It’s one of the best student films I have ever worked on, so we’ve posted it on-line. The film took about ten weeks to create, start to finish. The students are entirely responsible for the screenplay and I’m proud to say that I did not shoot even one frame of the final product – students wrote, shot, and helped edit the film. Chris Lyon, our newest part-timer at the Robinson Film Center, did lots of editing just because the students were too pressed for time with high-stakes testing this semester to do it all. My guess is that the students worked about 60 hours in all on this. 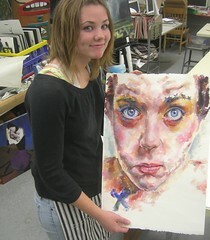 My goal is to get this outstanding piece of work seen by as many people – especially young people – as humanly possible. 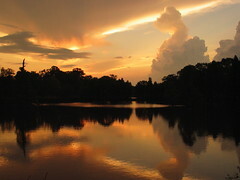 The creation of “All Things Come to Light” was made possible by grants from the Louisiana Division of the Arts and the Charles T. Beaird Foundation. Originally uploaded by Focus Pocus. 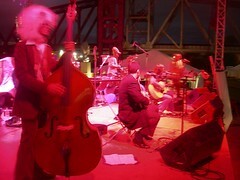 The annual 5-day Festival Internationale de Louisiane is held during the last full week of April in historic downtown Lafayette, Louisiana, says FestivalInternationale.com. The town on the Vermilion River is transformed via six music stages, food court areas, street musicians and animators, arts and crafts boutiques, art galleries, beverage stands, cultural workshops, international cooking demonstrations (m-hm) and a world music store. Events are free to the public and designed to encourage family participation from all sectors of the community (Lafayette's population is some 100,000). The fest is powered by some 1000 volunteers. All programming for the festival is designed to celebrate cultural expression in a variety of forms, they say. Imagine performers from Europe, Africa, Canada, the Caribbean and South America; from all across the former French Empire. 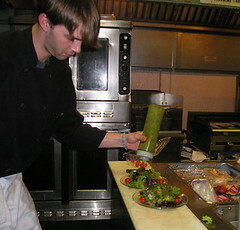 Then imagine their foods, plus the cuisine of Lafayette and Nouvelle Orleans, and a global offering of visual arts, too. As you will see, it's an alternative to New Orleans Jazzfest and an extraordinary event. The drive from Shreveport to Lafayette is under 4 hours of painless navigation, thus day trips to Fest Internationale ought to be on the agenda for many Louisianians. West Edge Books, 725 Milam St., will present New Orleans author, editor and activist Jordan Flaherty on Tuesday, April 24, at 7:00 p.m., says Michael Parker. Flaherty is an editor of Left Turn magazine and will be reading from his contribution to the recently published South End Press anthology What Lies Beneath: Katrina, Race and the State of the Nation. Flaherty's contribution is titled, "corporate reconstruction and grassroots resistance." Scheduled to appear with Flaherty is Jennifer Whitney, a Baton Rouge native and Pacific Northwest resident and co-editor of the anthology We Are Everywhere: The Irresistible Rise of Global Anticapitalism. She is a health care worker, and organizes clinics and street medic teams for direct actions. When she's at home in the Pacific Northwest, she can be found working with the Black Cross Health Collective in Portland, or drumming with the Infernal Noise Brigade. "My schedule has been hectic," Lee Marvin Willams wrote Carlos Colon and the Trapped Truth Society, "for all the right reasons, and it is about to get a bit busier. On Sunday, April 22nd, I leave for Los Angeles to take part in a USO comedy tour headed to Europe and the Middle East. The only confirmed stop thus far is Frankfurt, Germany. I will also be going into the 'war zone,' but for security reasons they do not give exact locations until you are enroute. I suspect it will at least be into Afghanistan, possibly Iraq as well. I am scheduled to return on May 8th, so I will be sure to update everyone then. Force and was never in a dangerous or hostile situation, so the least I can do is go entertain the troops that have to go all the way, very possibly some of the ones I recruited. itinerant pen for a while. I should get plenty of new material and ideas out of this trip. See you all soon! Lee Marvin Adams"
"The Tommy Welch benefit Sun, Ap 22, at 516 SS is a tribute to Tommy, an artist in every sense of the word, who passed to spirit in late February. This event serves," says Amy Guendelay, "both the community's need to gather in Tommy's honor and as a benefit to ease the financial burden to his family." 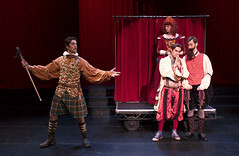 See more about Chris Alexander as well as Dirtfoot in the SptBlog Links. "It is also a one-day art exhibition featuring the work of artists Micah Harold, Courtney Manning, Ashley Harold, Joanna Ballard, Amy Guendulay, James Clements, Chris Stripling, Brandon Jenkins, Mike Paul, Savannah Porter, Thomas Little and others," added Guendelay. Originally uploaded by Antifluff Superstar. From editor-publisher Joshua Clark, at the National Book Critics blog: Louisiana In Words is coming out March 18. We're having a big party that afternoon at the Maple Leaf, and then on April 21 doing a statewide signing simultaneously in dozens of towns across Louisiana, involving the 110 writers, it's a first for our state. Sure It's a book I started long before Katrina, an answer to all the picture books we have about our state and city (and others done the world over on other places). I've long held the belief that a picture can say a thousand words, but the right words portray a million pictures, and I think these writers -- all 110 --- prove that. I culled through thousands of submissions. 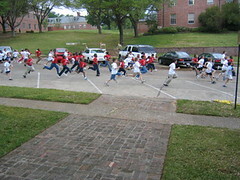 The only qualification, in a nutshell, was that it be one page or less, and one minute in time, anywhere in Louisiana. We got writers like Andrei, John Biguenet, and Bev Marshall, and many totally undiscovered ones (the real gem here, for me). Contributors at this event include George Newtown, Bobby Pierce, Sarah Elisabeth Roussel, Lina Mearl Beavers. Contributors at this event include Tricia Baker. The historic Highland neighborhood will receive national attention, says the Highland Area Partnership, when one of its bungalows is featured on HGTV. The Gilbert Drive home of Kenneth Koonce was shot by High Noon Productions for the series If Walls Could Talk. 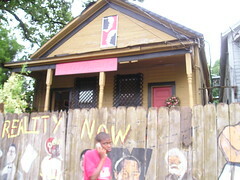 The episode featuring Mr. Koonce’s home airs Sunday, April 22, 2007 at 10 PM. According to the HGTV website, “If Walls Could Talk shares lore and intrigue from homes rich in history--some good, some notorious. Many of the featured buildings have housed famous (or infamous!) characters, while others are the sites of significant historical events. 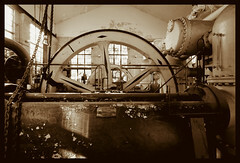 Some of the selected structures are simply filled with good stories or were home to everyday folks with colorful pasts." This was HGTV and High Noon Productions’ third visit to Historic Highland. 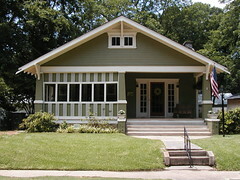 They previously featured a Fairfield Ave home on the 2002 series Great Places to Live. The Stoner Avenue Fire Station was featured on a previous episode of If Walls Could Talk. The producers apparently like our quaint neighborhood, because they recently asked for assistance in locating other area homes. It's Pat McCann's Birth Day again, somehow. Says Pat, formerly guitarist-singer with Heart's Island, Rue du Lac and many other Shreveport-area bands, "Please mark your calender. Friday May 4. 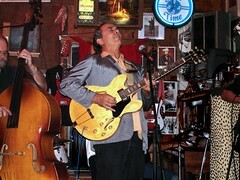 Join me and The Troubadillos at Poodies Hilltop Roadhouse. If all the stars Align properly, we're gonna record a live Troubadillo CD. You can expect a lot of great music and some surprise guest artists. Party starts around 8 o'clock. Originally uploaded by Jian Ailin 简爱霖. Says Sifu Janis Gabriel: "Greetings! would love to see you and yours at Betty Virginia Park for this year's celebration of world t'ai chi and qigong day. At 10:00 am (local time) Shreveport will join the celebration by continuing the world-wide wave of healing movement. Led by Sifu Janis Gabriel of the Phoenix Virtue Temple, festivities will begin in Betty Virginia Park (Line Avenue at Ockley) at 9:00 am with warm-up exercise and Qigong practice prior to T’ai Chi which will begin at precisely 10:00 am. World-wide, this event spans 60 nations on 6 continents in over 700 cities – come be a part of the energy, the education, the healing, the fun!!! 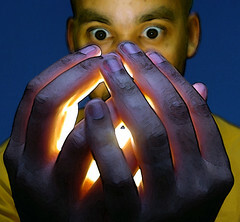 If you would like to see what's happening world-wide, please go to worldtaichiday.org and check it out. Also, on Sun, Ap 29, we will be hosting Karma Rinpoche, a Tibetan Buddhist lama who will be giving a teaching at the temple on the topic of "intention" as well as performing ritual... again, this will be held in the guan from 1 - 3 p.m. (approximately...could run a bit longer) and the fee is $15.00 per person. The Reverend Jonalu Johnstone, Minister for Programs and Covenant Groups at the First Unitarian Church of Oklahoma City, will speak at All Souls UU Church Sun, Ap 22 at the 11:00 a.m. worship service. Her topic will be "Why Pride?". Rev. Johnstone is president of Interweave (Unitarian Universalists for Lesbian, Gay, Bisexual, and Transgender Concerns). A graduate of Harvard Divinity School, she has a long list of accomplishments. 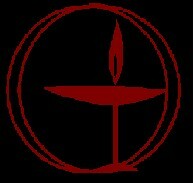 Interweave is a membership organization affiliated with the Unitarian Universalist Association. It is dedicated to the spiritual, political, and social well-being of Unitarian Universalists who are confronting oppression as lesbians, gay men, bisexual persons, transgender persons, and heterosexual allies. 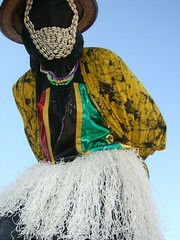 It celebrates the culture and lives of its members. Interweave membership is open to all interested UUs of any sexual or affectional orientation. All Souls will have a discussion on Interweave after the service. For more information on Interweave, go online here. Speaking of Pride, says respondent Adrienne Critcher, president of P.A.C.E. (Politicial Action Council for Equality): "NW Louisiana's own Gay Pride Dinner to be held on Saturday, June 16, will be announced soon. Watch for details." Fresh from the Northgate Music Fest in College Station, Dirtfoot is reveling in being called "Best Crowd Participation" group. Local journalists judged the Shreveport band better than 100 other bands in getting the crowd dancing and singing along, says Eric Gardner. Additionally, "We've been added to the Wakarusa Festival, Lawrence, KS," says Matt Hazelton. "We performed at a concert in Tulsa and won a slot at Wakarusa Fest, June 7 - 10, by our performance and the crowd reaction. Wakarusa is a festival a lot like Bonnaroo." This weekend the "Gypsy Punk Country Grumble Boogie" sextet plays Noble Savage Sat, Ap 21, and at a benefit at 516 SoundStage, 516 Texas St, on Sun, Ap 22. In the coming West Edge Artwalk, artists will display their work along the south sidewalk of the 700 block of Milam Street, says Debbie Engle. It will take place starting at 10 am on Sat, Ap 28. Sales continue til 6 pm. If additional artists' display space is needed, they will also display around the south corner of Common Street. If you are not a member of the West Edge Artists’ Co-op, says smiling representative Engle, a $25 donation to WEACo is required. Please submit donation with this registration form. This event will take place on Saturday, April 28, from 10 AM – 6 PM. Please let us know if you will be arriving late. Bring your own tables and/or supplies. Artists are responsible for own sales. May is National Bike Month, says bikeleague.org. 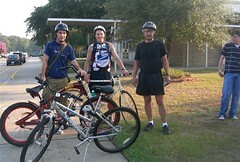 The League of American Bicyclists is promoting Bike-to-Work Week from May 14-18 and Bike-to-Work Day on Friday, May 18. We know this isn't Austin or Nashville or NYC. We know that the local idea is not to integrate bicycling into your life, but into the roof of your SUV rack and onto the country roads that have little to do with ordinary transit. Still, there's room for advocacy of all sorts in Shrevetown, isn't there? Please post a comment if you'll try to energize some commuting bikers in May. The invitation reads that the McNeill St Pumping Station, built in 1887, is to open as a museum showcasing steam technology, area history and the story of clean water in Shreveport's growth. There will be an opening ceremony Wed, Ap 25, at 12:15 pm. On hand will be La Sec of State Jay Dardenne. Finding this historic jewel at 142 N Common St has been problematic for new visitors. Call 221-3388 if you need help. The answering machine says "Waterworks Museum: open weekdays noon to 4 pm, and Sats, 10 to 4." Industry-minded and symmetry-minded photographers will find themselves in high cotton. New Works is an exhibition of recent paintings by Shreveport painter Bill Gingles and sculpture by Tennessee artist Meaghan Kieffer, says Amy Baber. The Amy Baber Fine Art gallery will hold an opening reception to meet the artists on Sat, Ap 21, from 6 - 8 pm. 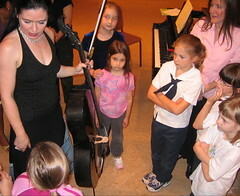 Music Memory is a national program that engages third to fifth graders in recognizing classics in concertos and jazz. Numerous Bossier elementary schools and a number of schools from Caddo will support their teams in the Shreveport Symphony Orchestra-sponsored contest. Please see more in this earlier post. The orchestra will perform a mini-concert while points are tabulated, says Michael Butterman, conductor. Highly recommended, except that it's on a school night. Friends of Thomas H. Welch will gather on Sun, Ap 22 at 2 pm to celebrate the former Shreveporter's life and accomplishments at an art & music tribute. Performances by Dirtfoot, Chris Alexander, Kern Courtney, the Peekers, and other musicians will take place alongside displays of original art in a one-day exhibition. The site is 516 Soundstage, 516 Texas St.
Eds note: This thoughtful essay is by writer Cassie Smith and is posted at her Janedoughnut site (see links). Memorial services for Tommy Welch have also been held in Colorado and California. Sunday's tribute will provide an opportunity for all those in Shreveport touched by Welch to gather together in remembrance. Organizers will also be raising money for Welch's family. 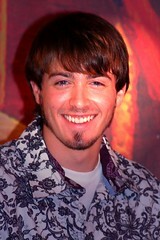 Tommy Welch passed away in Los Angeles on February 27th at the age of 29. He grew up and lived in Shreveport until moving first to Colorado Springs and then Long Beach and Los Angeles with punk band Raised Under Reagan. During his time in Shreveport, he was an influential player in the music, art and theater communities. He used his talents in everything from his work with children to expressing his anger with the government and status quo. Friends describe him as someone that lived every day like it was his last. He was an inspiration for countless people from the deep south to the west coast. Welch attended C.E. Byrd High School and graduated from Centenary College in 2001 with a degree in Theater. He stayed involved and invested in the community in more ways than most of us would have the energy for. Among other things, he worked with KSCL, Centenary's radio station, was active in local theaters including the Marjorie Lyons Playhouse, and passed his love of drama on to children through drama workshops, art classes, and the Peter Pan Players children's theater. Welch was also active in the music community and worked with groups like Shrevepunx, booking shows at the Zebra Room and expanding the range of music available locally. The tribute, which will be on the eve of Welch's 30th birthday, is open to the general public. To contribute or to find more information, contact Amy Guendulay at 865-5257 or 210-5836. Mahogany Ensemble Theatre continues its 2nd season, says Angelique Feaster, with the Louisiana premiere of Ramona King's comedy Steal Away. Set in Chicago during the 1930s, it is about five upstanding church ladies who raise funds to send young black Women to college by holding bake sales, selling church suppers, and the like. To increase the number of scholarships, during the Depression era, the women come up with a new idea to raise the money: robbing banks. Steal Away is a light-hearted comedy for the entire family. Director Angelique Feaster has assembled an ensemble full of personality, featuring Neverlyn Townsel, Mary Thompson, Dorothea Townsel, Lorie Pennywell, Sharon Penson, and Angelique Feaster. 4:30 matinee and a 7:30 evening performance. Tickets: $15 for adults, $10 for senior citizens and students, $5 for children 12 and younger. Group rates are available. Tickets can be purchased at the Mahogany Ensemble Theatre box office at 318-870-2787 or email mahoganytheatre@hotmail.com. "We had a great rally yesterday," says Janet Creech; "beautiful weather and lots of people! There was an article on the front page of the Times which continues on page 3A. Unfortunately, there are no pictures in the online copy. The link to the page 3A story is below. Again, thanks to all for making this possible. 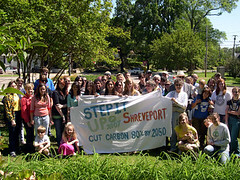 Remember, this is just the beginning for Shreveport." You can go to the step it up website to see pictures of our event. 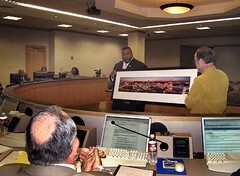 Shot in high resolution from the roof of the Horseshoe Casino Hotel is an image of Shreveport presented by photographer Neil Johnson to the mayor. "The framed print shown has been loaned to the office of Mayor Glover for the duration of his administration and will hang behind the Mayor's desk. The image is extremely high rez and you can easily see details in things like the Mega-Mural," says Johnson. "The same image was printed as a 10-foot-long "gallery wrap" (printed on canvas and displayed on a stretcher frame) and will soon be put on display in City Hall's conference room. Additionally, the image (or part of it) will be printed on all new business cards of City department heads and will be added to the City web site, as well as grace the cover of the 2006 City annual report." Johnson, from a family known for quiet volunteerism, told the City Council, "I love this city and I hope this image reflects that as well as a single image can." Bill Daniel: Who is Bozo Texino? An airing of filmmaker Bill Daniel's "Who is Bozo Texino?," as well as some of his other projections and a piece by multi-media artist Dan Garner will be presented en plein air Thurs, Ap 19th, in Artisan's Court (the lot on Texas st next to 516soundstage and across from the Courthouse), says Susan Garner. The show starts at 7:30pm. The cost is $5. Who is Bozo Texino? chronicles the search for the source of ubiquitous railroad graffiti. Daniel's film uncovers a secret society and its underground universe of hobo and railworker graffiti, and includes interviews with legendary boxcar artists Coaltrain, Herby, Colossus of Roads, and The Rambler. During his freight-riding, 16-year quest Daniel discovered the roots of a folkloric tradition that has gone mostly unnoticed for a century. Taking inspiration from Beat artists Robert Frank and Jack Kerouac, the film functions as both a sub-cultural documentary and a stylized fable on wanderlust and outsider identity. Welcome to the gentle but stimulating world of the arts in the Red River region. We think you will find your niche in Shreveport-Bossier whether you are . . .
* ready to get better acquainted with the arts but don't have a lot of background. The links section of this blog is your menu. This selected list contains sites of individual artists and organizations who will welcome your inquiry. It's not unusual locally to make contact with arts-related people in advance of moving here and develop a correspondence that leads to early and productive friendships. Spt-Bossier (SB) is a region working hard to do a more complete job of ethnic integration in the arts. Overall, we see the best ever multi-ethnic presence and cooperation in the region. Along with a great orchestra and opera and rock scene and video and movie scene - to mention a few - there are problems to be addressed. That's where you come in. The more fresh ideas, the better the chance to make progress with the obstacles that face the area. Please don't hold back. Call or email organizations or individuals to ask for advice. We will be happy to hear from you. I personally get a steady number of emails from people headed in this direction. I am delighted to say Hello and point them toward promising connections. For one thing, if you wish to volunteer as an writer or photographer for ShreveportBlog or ShreveportFaces I'd welcome your contributions - and comments. 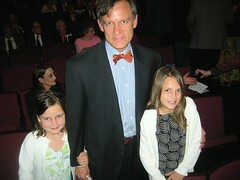 Above is Lampton Enochs and his daughters, Dallas and Agnes, attending the Shreveport Symphony. They moved here from New Orleans in the course of producing the movie Harold & Kumar II. 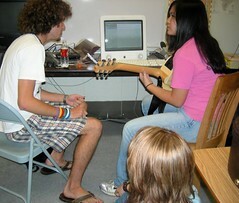 He recently wrote, "Enjoyed your blog about the symphony. I’m ready to take up the gauntlet for integrating the film and music industries in North Louisiana. Can’t see any reason why we’re not doing some recording here for film projects. Maybe we’ll have Michael Butterman conducting for a soundtrack one of these days… preferably soon. Glad you are out there pushing the arts." That's an exemplary response from a newcomer. Now, we look forward to your Hello. The newest singing performer search in America is in Shreveport-Bossier: it's the ArtBreak Idol. Throughout the week leading up to the grand opening of the Public ArtBreak festival, hundreds of students will vie for the $1,000 ArtBreak Idol Award presented by the Bossier Arts Council, says Richard Folmer. The ArtBreak Idol is a talent search competition to identify the outstanding singing performer in the region; Richard Folmer, Director ,and Anne Sussman, Development Coordinator for the Bossier Arts Council, are producing the ArtBreak Idol Competition. Students will progress through a series of stringent elimination rounds to finish among the top three contestants who will perform at the start of the ArtBreak Awards Ceremony on Sunday, April 29th. 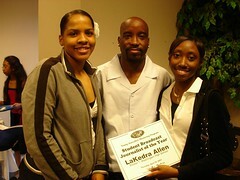 The open audition takes place on Wed, April 18 at Spt Convention Center. Students must attend a participating school in Caddo or Bossier Parish to be eligible to participate, and will sing – a cappella (without instrumental accompaniment) one song that is a maximum of three minutes in length. The judges have the right to stop the student performer at any point in the song to reject or accept the student for additional competition. Those students selected to perform in the Round I Elimination will be expected to perform through a variety of “musical hurdles” including an assigned song, assigned choreography, and interviews. The major public performance by the contestants in the ArtBreak Idol Competition will be held at 6:30 pm, Saturday, April 28, on the Chase Bank Stage. The performance will open with the 25 top performers, then there will be an elimination of ten performers and a competition among the remaining 15 performers to achieve the final – top three contestants – ranking. The final showdown will take place at 2:00 pm, Sunday, April 29th and the winner will be announced as the last award presented during the ArtBreak Awards Ceremony. * free “Yellow Bus Trolley” shuttle from the AmSouth Bank Parking Garage to the Convention Center. "There's a newly "hatched" Bluebird drummer," says Bruce Flett. "He's Cody Lowery. A great drummer and a great kid, Cody has learned how to play the right "feel" from Hines Williams and playing with Dan Sanchez." Jason Coffield is filling in for Buddy Flett on Stratocaster and Super Reverb. 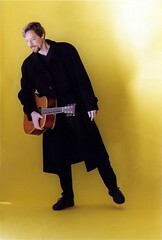 "Buddy Flett is still on Kenny Wayne Shepherd's "Blues from the Backroads" tour. They were live on the "Bob and Tom" show nationwide this past Monday; Buddy was featured on "Dust My Broom". Thursday night they were at House of Blues Chicago, tonite Toledo, OH, Sunday at House of Blues- Cleveland. Next week, Boston, NYC, Baltimore, Atlantic City, Alexandria,VA." Ap 29 New Orleans Jazzfest Bluebirds at 1:10 pm - 2:05 pm, Lagniappe/music&heritage stage. Voces Castellanas, an Iberoamerican group of women and men living in Shreveport, will present an evening of dance, prose, poetry, and essays in Spanish. Their material is the work of the world-renowned Argentine author, Jorge Luis Borges. The LSUS Spanish Club will also participate, says Lillian Moskeland. Borges' works, which represent themes from the Orient and Western worlds, will be recited, enhanced by music and dance from both worlds. 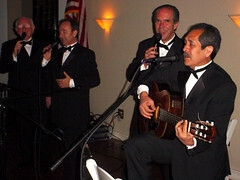 The purpose of the Voces Castellanas is to promote the beauty of the Spanish language and culture. Th, Ap 19, at 7:00 p.m.
"I've finally succumbed to the mighty keyboard and joined the ranks of bloggers. I must admit, once upon a time a looked down on the blogging nation with a "tsk, tsk" sort of attitude. But things have changed, and exposure to numerous area blogs and the search for information in the fields of photography and photojournalism have changed my mind. In addition to posting blogs for my day job as a staff photographer for The Times, I have also created my own blog," writes Greg Pearson. "I hope to provide viewers with photography and photojournalism resources, advice, tips and techniques, behind-the-scenes looks, and plain ol' daily rantings about my work and the things I see around me...thus, I've aptly named my blogging adventure, Life Eyewitness. You won't find any poltical ramblings or highly controversial entries (I find blogs of that nature attract intolerance and ignorance), but you Will find opinions on photojournalism ethics in addition to thoughts regarding my images and work." 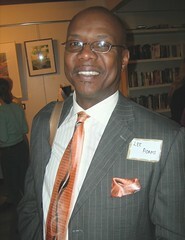 Pearson adds, "I've enjoyed your blog and efforts to let SB folks know of the art scene that surrounds them. Thanks for the mention of my web site by the way. I just noticed it today. We've been tracking hits to The Times photo blog (The Big Picture) and know folks are visiting and returning (many linking from your blog site), but we hope to get more interaction in the way of comments in the future, as I hope to get the same on my personal blog." "A festival this big – spanning more than 100 schools, including more than 50 hands-on art activities, featuring 100 school and community performances, and exhibiting more than 2,000 works of art by students - needs to be housed in the biggest site in town: The Shreveport Convention Center," says Pam Atchison of Spt Regional Arts Council. 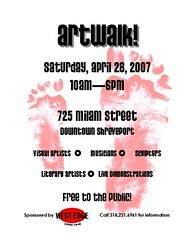 ArtBreak Festival will take place from Monday, April 23 through Sunday, April 29, 2007 at the Shreveport Convention Center. Admission to ArtBreak is free; there is free parking surrounding the Shreveport Convention Center; there is a free “Yellow Bus Trolley” transporting festivalgoers from the AmSouth Bank Parking Garage to the Shreveport Convention Center. 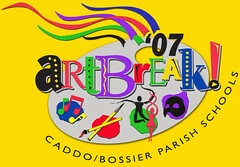 ArtBreak Festival includes arts programs in both Caddo and Bossier Parish Schools. Writes Ron Hardy: We want to announce that this year The Ledbetter Heights Music & Arts Fair is cancelled. It will resume in 2008 as The Lead Belly Blues Fest. With a new name and a new attitude next year's festival promises to be a larger, broader event with national and international appeal. This event will be a collaborative effort by Playaz and Playettes, Inc and the Lead Belly Foundation. Located in Brentwood, Tn, the Leadbelly Foundation is run by Tiny Robinson, Huddie's neice. Ap 25 at 1:30pm / Bethune Middle School. Ap 26 at 11am / Southern University on MLK Jr. Drive. Ap28 at 2pm / Job Corps. Ap 30 at 1:30pm / Booker T. Washington High School. Upon my word: there's a published WS Gilbert scholar in Shreveport ready to speak to theater mavens between his directing duties for the Gilbert and Sullivan Society - see the show Mon night at the Strand. Says Leslye Gilchrist, "Join us at Barnes and Noble on Sat, Ap 14, at noon to hear an entertaining and informative lecture by Ralph McPhail, Jr., Professor ot Theater Emeritus, Bridgewater College, Artistic Director, Austin Gilbert and Sullivan Society." Since McPhail's learned in regards Rosencrantz and Guiderstern, 1874, I've run a photo from Rosencrantz and Guidernstern are Dead, probably 1974. Peachy, right? 1. 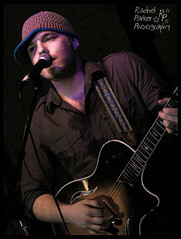 Marc Broussard, Gold Dome, Fri. Hear him at myspace.com/marcbroussard. Mmm. 2. Spt Opera Express on Broadway at East Ridge CC. Fri.
3. Kollege Kapers: jazzy song & dance at MLP, Centenary College. Fri. 8 pm. 4. Chimp Haven Discovery Day. Sat, Ap 14, 9 to noon. 5. Earth Day at Sankofa Gardens, Linwood Village. Sat: 10 to 2 pm. 6. Clyde Edgerton, Spt Country Club, Sat at noon. 7. Darrell Scott, Fairfield Studios. Sat. 7 pm. 8. Art opening at Alexander & Co, Salon / Gallery. Sat. 7 pm. 9. Step It Up / National day of Climate Action. Sun. Columbia Cafe, 2 pm. 10. Noble Savage benefit, Texas St. Sun. 3 pm and on. 11. Spt Metropolitan Ballet. Sun 3 pm. 12. Meet Donna McKechnie. Sun 5 pm. 13. Mystery of the Nile, Imax movie. SciPort. Next week: Pirates of Penzance at the Strand. Mon. Also, Music Memory competition with the SSO Tues at Caddo Magnet HS. Most of these events have their own explanatory posts on SptBlog. Scroll back, cher. More events can be sussed by hitting the newly refurbished links section. And if I've overlooked something, would you please add it below in the Comments section? There's nearly always something else, y'know. Says John Grindley of the Robinson Film Center: “The Great Debaters”, a new feature film scheduled to shoot mid May in Shreveport, is hosting a city wide open casting call on Sun, April 15, from 12 am to 4 pm. 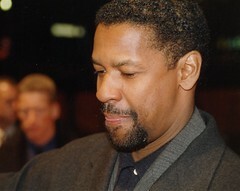 The Great Debaters will be directed by and starring academy award winning actor Denzel Washington. Actors and Extras interested in participating in the movie should come out and meet the Casting Directors with photos in hand. If unable to attend please send photos to: The Great Debaters Casting, 9595 Mansfield Road Shreveport, La 7118. "Tickets to the dress rehearsal tonight are $5," said Sarah M Silver, ballerina dancing the role of Ciinderella in Shreveport Metropolitan Ballet's production. Silver, formerly Sarah Gross and formerly of Shreveport, will be joined onstage by fellow artists from the Columbia City Ballet of South Carolina in the run-up to the full performance Sunday at 3 pm. At graduation from Caddo Magnet HS and after some 10 years with SMB she won a scholarship to a school she says is called "the Harvard of dance: University of Utah." She later joined the City Ballet of San Diego and has also danced with the California Ballet. "Ballerinas don't make what's considered a living wage," she explained to students at her alma mater. She has developed a Ballet Burner fitness dance class for the Y and is also becoming a dance photographer. Kendra Meiki, director of SMB, and her parent team and corps of student dancers must be encouraged by the almost-sell out response of the public to the concert. Yet, Silver pointed out, "In recent years funding for dance companies is down. Yet there are more young dancers trying to make it a career than ever." The National Day of Climate Action is aimed at pushing Congress to Step it Up and legislate a change to cut carbon emissions 80% by 2050, says Janet Mighell Creech. Shreveporters who care about such change can meet at Columbia Cafe on Sun, Ap 15, at 2 pm for a photo session. The photo will be served to the appropriate members of Congress. Much of my world view and impetus to chronicle was mudged by the writing of the late, great soul, Kurt Vonnegut, Jr. And almost every night my wife and I attempt to commit boku-maru before attempting to sleep.